So recently a phenomenon has taken the web, a concept which allows people to literally help dreams come true, a movement rallying the masses to conjure up a lost hope for success. What is this miracle I speak of? It is known as Kickstarter, a website that allows fans to fund projects to once promised games, art shows, a person's success and more. 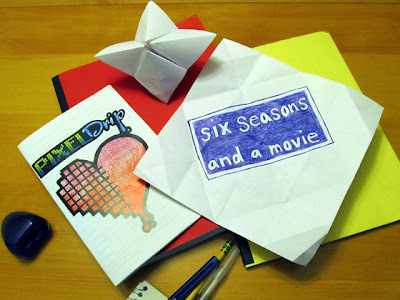 PixelDrip Gallery has started their own Kickstarter in hopes to fund our next big art show: "Six Seasons and a Movie" Art Show and met their goal in well under a week! Even though we met our goal, donations are still welcome seeing as you can still get prizes for various amounts funded. Not to mention you continue to help us make the show even better! 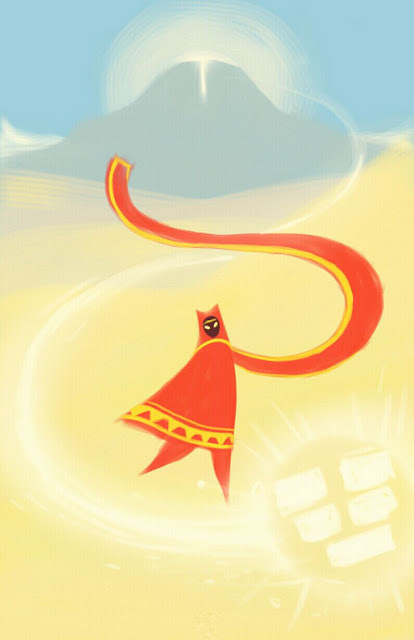 Recently I've been utterly obsessed and in love with thatgamecompany's game Journey. An artistically gorgeous and audibly amazing experience every person, gamer or not, should play. My one dream is to create a game similar to their games or, most desirably, work for thatgamecompany. In lieu of their inspiration on me, I created a quick fanart, and let it be known, this won't be it's last! By the way, Journey's soundtrack, by the musical genuis Austin Wintory, is now out on both iTunes and the Playstation Network. 18 incredible songs for $4.99!!! Well I couldn't find paint, canvas, brushes, not even my sketchbook... So I stole my fiance's Samsung Galaxy tablet for a moment and created this Journey(Facebook Page) inspired piece while listening to the game's emotional music. Thank you thatgamecompany(Facebook Page) for the amazing game! And I'd like to mention, I was drawing off of memory as I listened to the soundtrack, so some details will be off. By the way, the symbol was of my first Journey companion the first time I finished the game =] I remembered it was the shape of a heart. In my next blog I'll be revealing another Kickstarted project for the game we started for the Global Game Jam. I spoke about Rhea a couple of blog entries ago, created by my team Infinity 8. I'll also have some updates on current art venturs such as the "Six Seasons and a Movie" Art Show, Blizzard's Diablo III Art Contest, and more! Thank you yet again for reading and so long until next post!